He lay dead in a pool of blood. 彼は死んで血の海に横たわっていた. So far we have too little money in the pool for a party. パーティーを開くには今までのところほとんど共同資金がたまっていない. The two brothers pooled their savings for three years to buy a car. 二人の兄弟は車を買うために 3 年間共同で貯金した. We couldn't play baseball because there was a pool of water on the school ground after the storm. We bought a computer with money from the pool. We pooled our money and bought a cabin cruiser. The rain left pools in the road. (賭(かけ)ごとの)総賭金, 共同賭金；((英))[the 〜s](郵便で行なう)サッカー賭博(とばく)(((正式)) football 〜s)；ゲームに賭ける人. A combination of one or more front-end servers and a SQL database that is either hosted on the front-end server (Standard Edition configuration) or on one or more back-end servers (EE configurations). 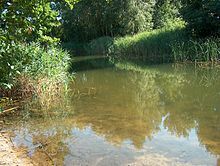 From Middle English pool, pole, pol, from 古期英語 pōl (“pool”), from Proto-Germanic *pōlaz (“pool, pond”), from Proto-Indo-European *bale- (“bog, marsh”). Cognate with Scots puil (“pool”), Saterland Frisian Pol (“pool”), West Frisian poel (“pool”), Dutch poel (“pool”), Low German Pohl, Pul (“pool”), German Pfuhl (“quagmire, mudhole”), Danish pøl (“puddle”), Swedish pöl (“puddle, pool”), Icelandic pollur (“puddle”), Lithuanian bala (“bog, marsh, swamp, pool”), Latvian bala (“a muddly, treeless depression”), Russian боло́то (bolóto, “swamp, bog, marsh”). A small and rather deep collection of (usually) fresh water, as one supplied by a spring, or occurring in the course of a stream; a reservoir for water. Charity will hardly water the ground where it must first fill a pool. The filthy mantled pool beyond your cell. A small body of standing or stagnant water; a puddle. There is a limited pool of candidates from which to choose the new manager. (by extension, computing) A set of resources that are kept ready to use. A small amount of liquid on a surface, such as a pool of blood. (sports) A cue sport played on a pool table. There are 15 balls, 7 of one colour, 7 of another, and the black ball (also called the 8 ball). A player must pocket all their own colour balls and then the black ball in order to win. He plays pool at the billiard-houses, and may be seen engaged at cards and dominoes of forenoons. In rifle shooting, a contest in which each competitor pays a certain sum for every shot he makes, the net proceeds being divided among the winners. Any gambling or commercial venture in which several persons join. The stake played for in certain games of cards, billiards, etc. ; an aggregated stake to which each player has contributed a share; also, the receptacle for the stakes. A combination of persons contributing money to be used for the purpose of increasing or depressing the market price of stocks, grain, or other commodities; also, the aggregate of the sums so contributed. The pool took all the wheat offered below the limit. He put $10,000 into the pool. (rail transport) A mutual arrangement between competing lines, by which the receipts of all are aggregated, and then distributed pro rata according to agreement. (law) An aggregation of properties or rights, belonging to different people in a community, in a common fund, to be charged with common liabilities. We must pool our resources. Many on both sides agreed that we should give small businesses and individuals the ability to participate in a new insurance marketplace – which members of Congress would also use – that would allow them to pool their purchasing power and get a better deal from insurance companies. "She must be exceedingly clever to have beaten the police the way she has for the last few years; and—er—I worship at the shrine of cleverness—especially if it be a woman's. The idea struck me last night that if she and I should—er—pool our resources, we should not have to complain of the reward." "Oh, so youse wants to work wid her, eh?" sniffed Rhoda Gray. "So dat's it, is it?"